Canon has not chosen to make significant investments in the mirrorless interchangeable lens camera (ILC) market, sticking with focusing on its very popular DSLR camera models. 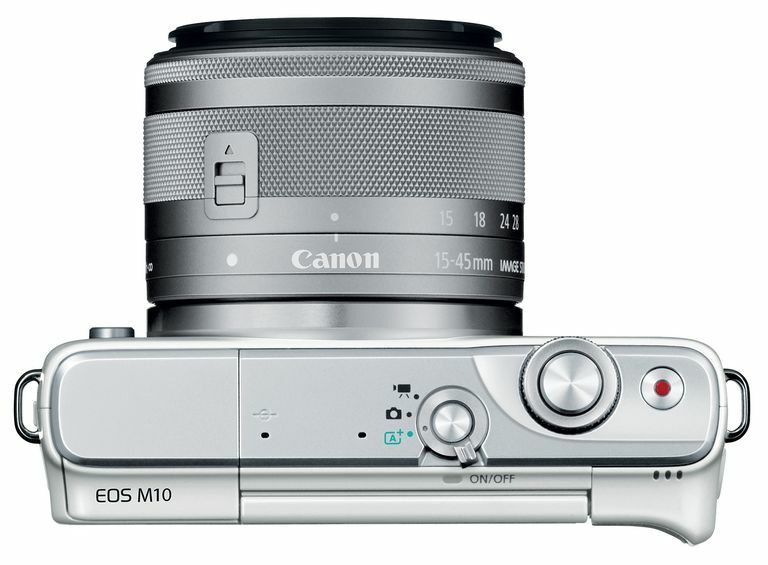 But Canon isn't completely abandoning the mirrorless market either, as shown by its recent release of the Canon M10. It's very much a beginner-level mirrorless camera, as shown in this Canon EOS M10 review, and, as such, it has some drawbacks. But the M10 fits in pretty well against other cameras that have a similar price point, as well as against another entry-level mirrorless ILCs. It's one of the least expensive mirrorless cameras on the market, even after you purchase a lens or two (Keep in mind that you cannot use the same lenses for Canon DSLR cameras as you can for Canon mirrorless models.). With some of this camera's drawbacks, I'd almost be tempted to go with an entry-level Canon Rebel DSLR model over this one, as the basic DSLRs are only slightly more expensive than the M10. Rebel DSLRs have been around for decades, and provide strong performance levels and image quality. The M10's biggest benefit versus those entry-level Rebels is its thin size of just 1.38 inches without the lens attached. Otherwise, Canon's Rebels will provide a better experience for most photographers over the M10. The Canon EOS M10 does a nice job with image quality versus other entry-level mirrorless cameras and versus other models in its price range. The M10's images aren't significantly better than its competitors, but they are above average. Personally, I like the image quality of Rebel DSLRs a little better than what's found with the M10, but there isn't a huge difference. The Canon M10 does a nice job with indoor photography, nearly equal to its performance with outdoor photography in sunlight. This isn't always the case with mirrorless cameras. The M10's 18 megapixels of resolution and its APS-C sized image sensor allow for the good performance indoors. However, the good indoor performance doesn't continue if you're shooting at a high ISO setting. Once you hit the midpoint of the M10's ISO range -- say around ISO 1600 -- you'll start to notice significant noise in the images, High ISO settings are not really usable with this camera. Try using the built-in flash unit wherever possible, rather than increasing the ISO past 800. The Canon M10's performance levels are impressive, as Canon gave this camera its DIGIC 6 image processor, which leads to some fast operational aspects. You can shoot between four and five frames per second in burst mode, which is a solid performance for a mirrorless camera. The M10's shutter lag is a bit disappointing -- it can approach half a second in some shooting conditions where you're unable to prefocus by holding down the shutter button halfway. At some point, you will miss some spontaneous photos because of this shutter lag issue. It certainly isn't the type of shutter lag problem you'd experience with a basic point and shoot camera, but it is more noticeable than what you'd find with a Rebel DSLR. Battery performance with this model is a bit below average, which is a disappointment. However, this is a common problem with thin mirrorless ILCs, as they must have a thin battery to fit the overall design of the camera. Just understand that if you choose to use the M10's built-in Wi-Fi capabilities, the poor battery lifespan problem will be magnified. The thin camera body found with the Canon M10 gives it an advantage over the Rebel DSLRs. No DSLR can match the EOS M10's 1.38-inch thickness measurement. Although you can use the M10 one-handed, it's a little difficult to hold this camera with one hand because it has no right-hand grip area. The front of the camera body is smooth, so you have to try to hold it more like a point and shoot camera with a pinching grip, which can be difficult because of the way the lens protrudes from the camera body. It's just easier to hold the camera with two hands. Canon gave the EOS M10 tiltable and touchscreen capabilities, which is great to find on a camera that's aimed at inexperienced photographers. The camera also has very few buttons and dials, meaning you'll be using the screen the majority of time to make changes to the settings, so having touch capabilities makes this model easy to use. The build quality for the EOS M10 is very solid. There's no loose parts or flimsy aspects to this Canon model.